Limited stock with deep discount , Ask Us! The 7591 is a true American tube and a relatively new one! We prefer it over other older 8-pins power tubes due to its efficiency, sweetness and power, thanks to its relatively newer design in comparison. This is a very good tube and it was commonly seen on older amps or receivers such as Sansui, Scott, Fisher, McIntosh, Eico, Heath, Sherwood. Don't underestimate the suggested low power rating! This might be the finest Class A 20 Watts around town money can buy, which will mate happily with lower efficient speakers / darker sounding speakers! The vivid colours, wide band dynamics, ultra details, quality weighted bass, a dark and well-spaced sound-stage, and so on, all which often would be seen on pure Class A amplifiers priced in folds. All you need is a pair of good 12AX7 that matches your system, and this pair of front end tubes is crucial and will dictate to the entire presentations. The ST-X series: The only amplifiers in the world designed by individual clients, and custom build to OUR CUSTOMERS ONLY! Like the famed Dynaco ST-70 amplifier, our amplifier’s name begins with “ST” (for “stereo”), because we knew we wanted to offer compact, affordable, high-fidelity tube amplifiers. We added the “X” because we wanted to make amplifiers that can be customized by our clients. From that point, clients can choose transformers or supply their own to save more, and a variety of premium parts (including capacitors, of course). Usually higher output power necessitates larger transformers and higher capacitance, but these are user choices, and we will guide each client through every step, in creating his or her unique, beautiful, amazing-sounding amplifier! Wait a second... That amp looks familiar! What does this have to do with the original Dynaco ST-70? Very little! The ST-X incorporates a brand-new, modern driver design for both vastly improved specs and killer sound! The ST-X is simply tighter, faster, and easier to maintain. 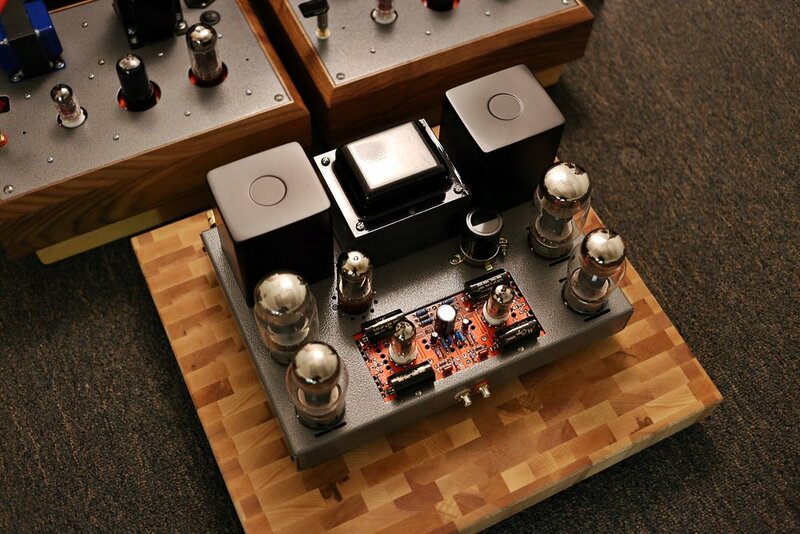 Sure, we used a chassis styled like the ST-70’s because we’re drawn to its compact footprint, as well as, its versatility in fitting various transformers and other superior components. We also chose to offer an amp like this because many customers with a “do-it-yourself” approach have transformers in their closets from years ago. The ST-X represents a perfect platform to use them! No matter what transformers you have, we are happy to advise and guide you to make the best use of them. Your components might work better in pure Class A, or your output transformers might perform best in triode mode, rather than pentode mode. You might also prefer to set bias manually. An exciting part of this journey is that the combinations are almost limitless! Feel free to contact us for a consultaton! Let us know what you have, and share your goals. With our vast experience, we can work with you to create a beautiful amplifier that will leave you listening happily for years to come! It could be a flea 4 watts into Class A Push Pull Triode mode with 6V6, or 40W+ with EL34 in Class AB manual bias. The combination is infinite! These are our Grand Finales, our flagship models. For all the serious audiophiles who seek the finest large power tube amps. Being Pure Class A, these will drive most speakers with ease and deliver the best sonic quality above the crowd. Designed/engineered for pure Class A operations, special attention is paid to the power supply and transformers (All make in Canada). They are all driven by a 12AX7 and a 12BH7 in each channel, and custom finished for each order. 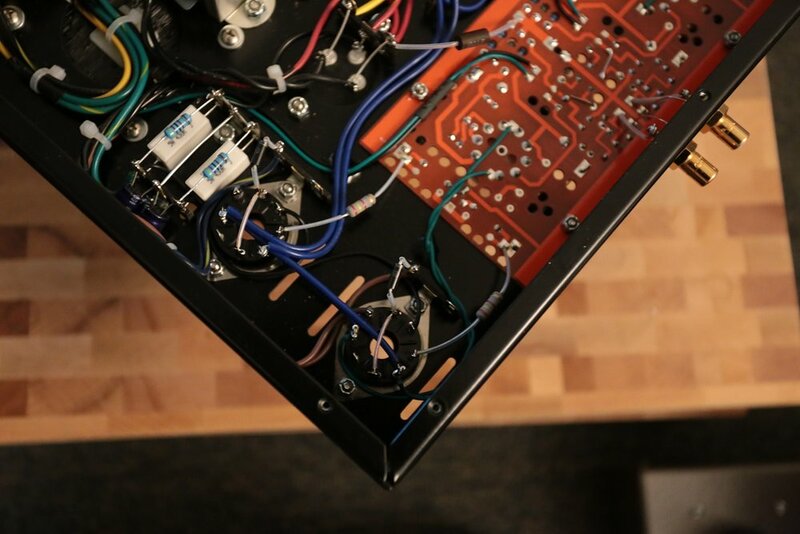 With six pieces of 6V6 tubes per channel, it has 12 of them total into one stereo chassis. Driven by a very powerful pre-amp section and combination of a pair of 12BH7 being driven by one 6922 in the front end. 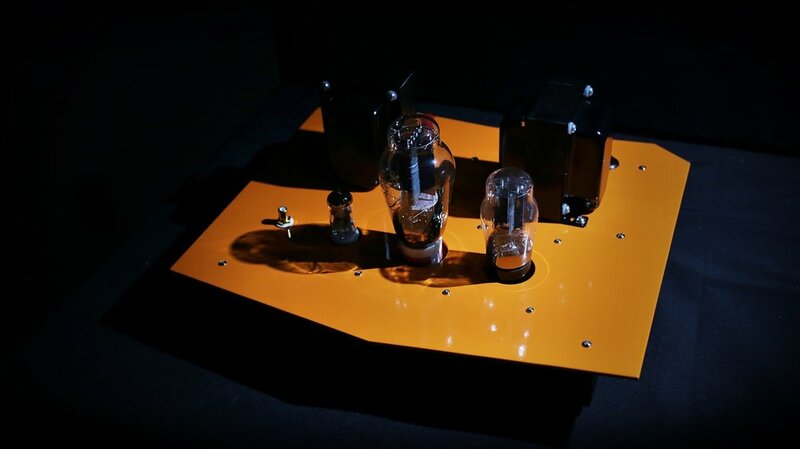 Autobias, Class A, results a rock solid 40 Watts engineered with the highest quality components and transformers. 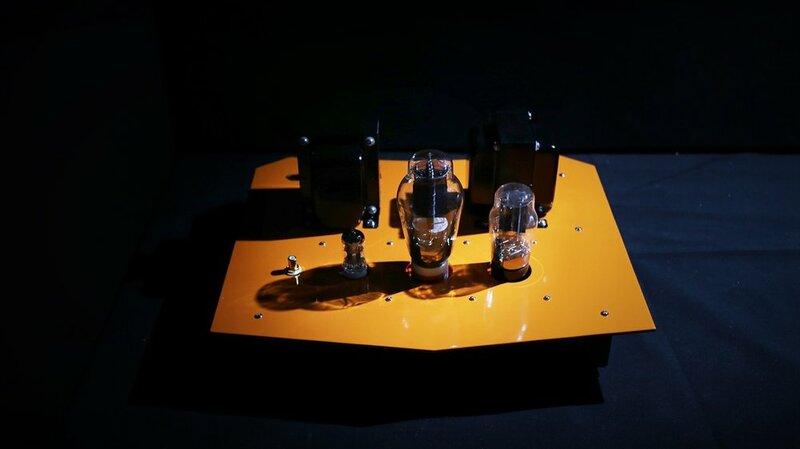 This is the best tube amplifier where power, refinement and durability/reliability are all combined into one. It's the only amplifier in the entire lineup that is fully hand-wired point-to-point, it's a remarkable work of art just to look at, in terms of our craftsmanship. 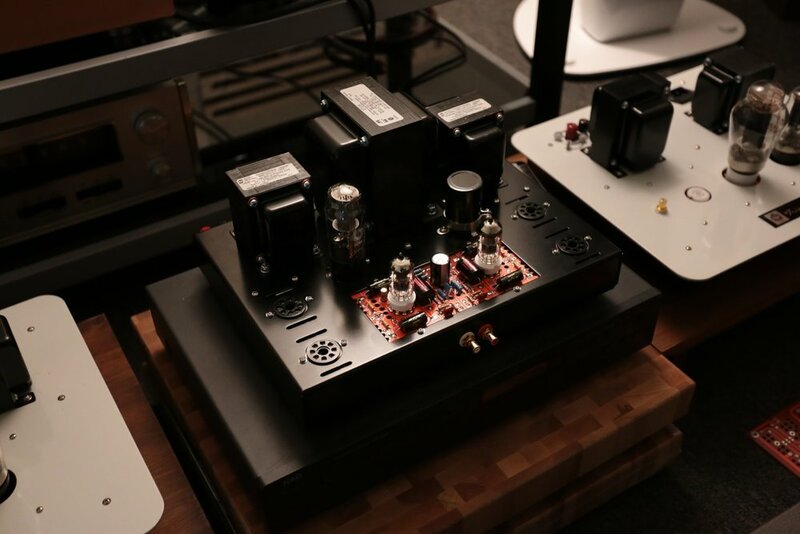 Signature Package $750 USD : Hashimoto Output Transformers (Remapped the circuitry to maximal the use with the uber Hashimoto, because every make and model of different transformers has different curves, insert loss, phase shift, and so on. Expect even better output power, distortion figures, inductance/weight, and perfecting curves!) / Mundorf Silver in Oil Caps / Cardas Rhodium RCA / Cardas Gold over Rhodium Binding Posts/ Furutech Japan Gold IEC AC Inlets ... etc.